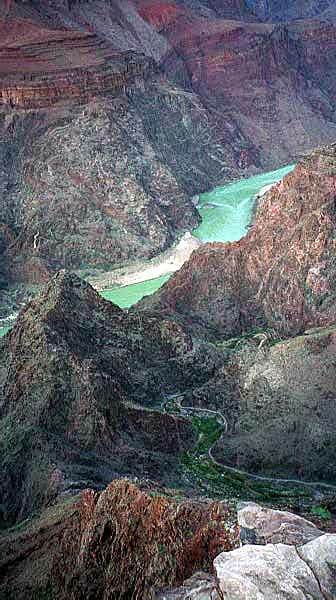 Bright Angel Campground and Phantom Ranch are at 2480 ft. elevation or about the median altitude for the Phoenix metro-area. That means that when it is cold and snowy at the rims it can be toasty warm and comfortable down below. That also means when it is pleasant at the rims in the summer, unprepared hikers can get into serious trouble with heat and lack of water down below. 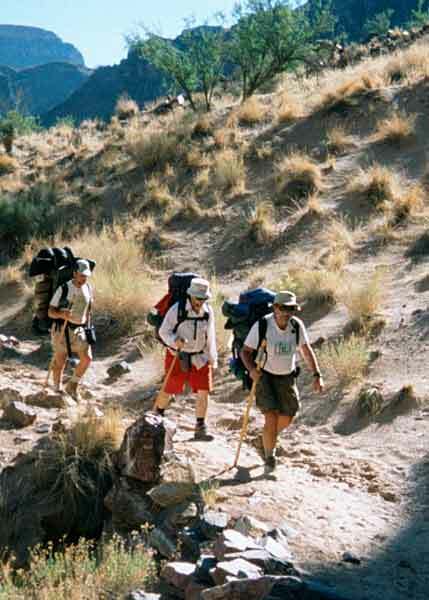 Our trip from the river to Indian Gardens on the Tonto Plateau will be about 4-½ miles and we will rise to an altitude of 4000 feet. We been alternating as point man as can be seen in this view from Alan's perspective. Eb has been keeping up the rear to keep his watchful eye on us (whatta guy!). Eb has also shown us some of the sights, just off the beaten path that we would have never seen had we been alone. We've seen petroglyphs and ruins almost right off the trail. 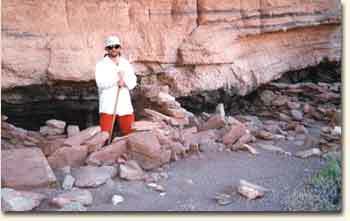 However, these Anasazi ruins were a 5 minute hike off the trail. Ryan is standing in one of the living units. 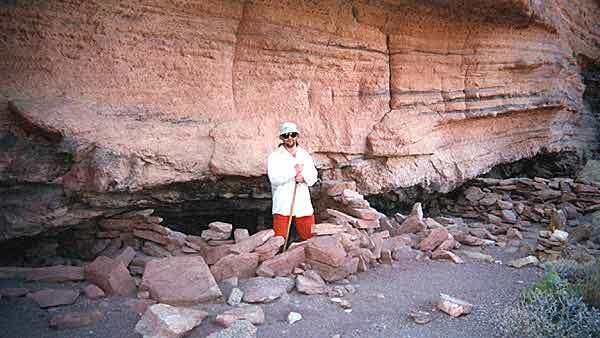 Directly above, built into the cliff, were the grainaries where they used to store their food. 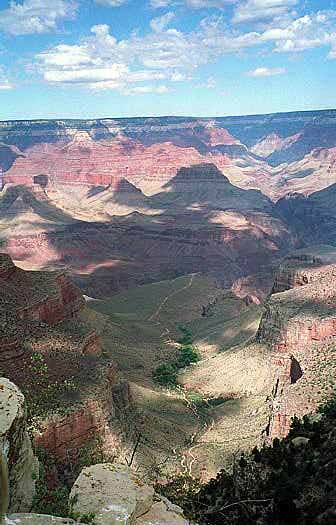 Indian Gardens is the "green bushy area" (really big trees) on the large flat area easily seen from the South Rim in the picture in the below left. 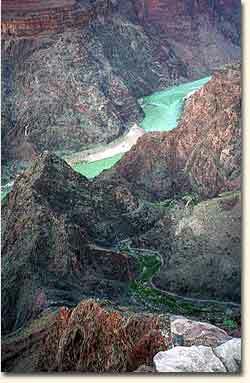 About 1-½ miles from there is Plateau Point, overlooking the Colorado River from where we came (below right). 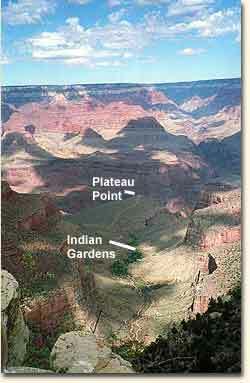 We can clearly see our destination, Grand Canyon Village at the top of Bright Angel Trail, from Indian Gardens. 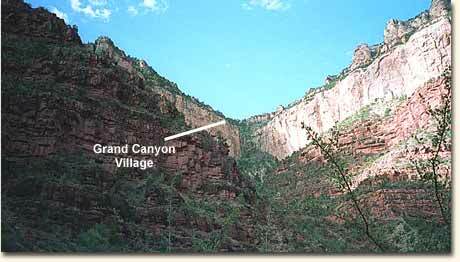 The village is just to the left of the Bright Angel fault. The fault can be easily recognized by the way the top layer of limestone to the right of the Village is broken and at different levels. 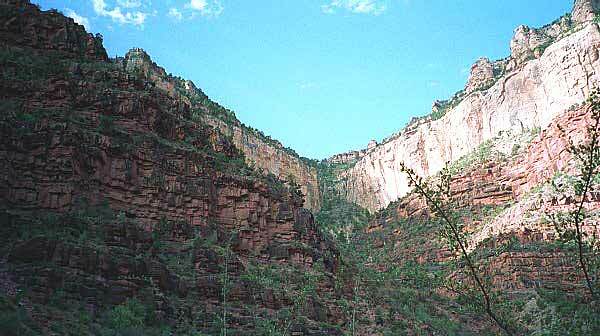 The sloping area between these mismatched limestone areas is where the switchbacks of Bright Angel Trail ascend. 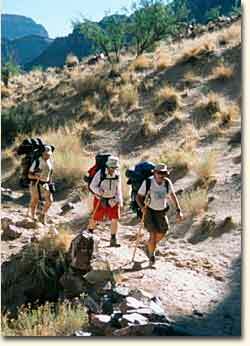 That's our goal for tomorrow, another 4-½ miles and elevation rise from 4000 to 7000 feet.